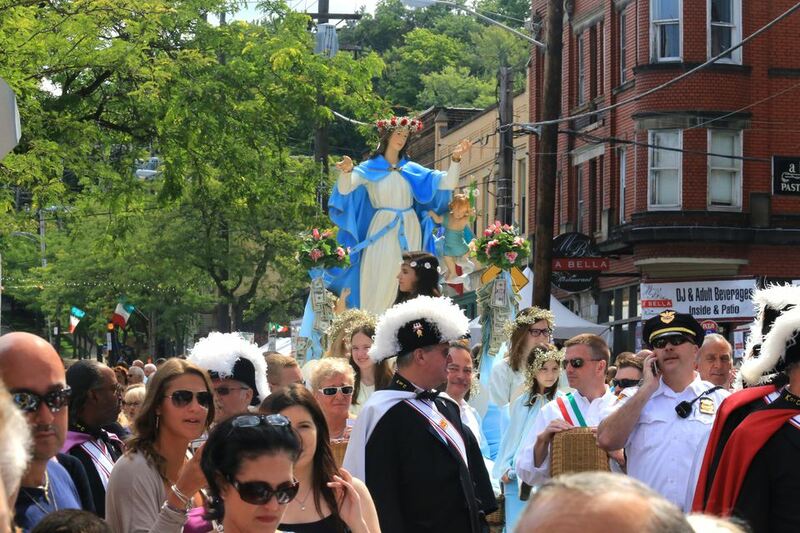 Cleveland's Feast of the Assumption, held each year in mid-August in the city's Little Italy neighborhood, is a four-day street fair that celebrates the Catholic Day of Assumption (August 15), when the Virgin Mary died and assumed her place beside Jesus. The Feast is a fun-filled Italian street party with rides, food, live music, a procession, and lots of fun. In the Roman Catholicism religion, August 15 is the Holy Day of Obligation known as the Feast of the Assumption. The Blessed Mary assumes her place in Heaven with Jesus Christ. The Assumption of Mary has two purposes. The first is that we celebrate the happy departure of Mary from this physical life on Earth. The second purpose is the assumption of her body into Heaven. The four-day Feast of the Assumption is a wonderful mix of respectful religious rites and secular fun. The entire length of Mayfield Road, between Euclid Avenue and Cleveland Heights, is closed off to traffic for the weekend. In its place are carnival rides, delicious Italian-themed food vendors, arts and crafts booths, and live music stages, playing everything from rock to "It's Amore." In addition, there are fireworks at night and a procession on August 15. Just as everyone is a little Irish on St. Patrick's Day; everyone in Cleveland is a little Italian during the Feast of the Assumption. The event draws more than 100,000 visitors each year. Admission is free. The central event of the Feast of the Assumption is the procession on August 15, where the likeness of the Virgin Mary is carried throughout the neighborhood, accompanied by music and costumed marchers, young and not-so-young. The Feast of the Assumption is located on Mayfield Road, between Euclid Ave. and the border of Cleveland Heights. Parking is available on the side streets bordering the festival. Alternatively, take RTA's Red Line (which runs from Hopkins Airport to Downtown to East Cleveland) to the Little Italy–University Circle stop (at the northeast corner of East 119th Street and Mayfield Road), about a block from the heart of the festival celebration. Many Rapid stations offer free parking. What Are the Top Halloween Events in Cleveland?